Having performed two contemporary operas (including commissioning Will Todd's Alice's Adventures in Wonderland) as part of their family friendly strand, Opera Holland Park ventured into contemporary opera on their main stage last night (6 June 2015) when, rather amazingly, they gave the first professional London performance of Jonathan Dove and April de Angelis's 1998 opera Flight. At Opera Holland Park, the work was directed by Stephen Barlow with Brad Cohen conducting the City of London Sinfonia. James Laing sang the Refugee, with Jennifer France as the Controller, Jeffrey Lloyd-Roberts as Bill, Ellie Laugharne as Tina, Lucy Schaufer as the Older Woman, Kitty Whately as the Stewardess, George von Bergen as the Steward, Nicholas Garrett as Minksman, Victoria Simmonds as Minkswoman and John Savournin as Immigration Office, with lighting by Richard Howell, movement by Sam Spencer-Lane and video design by Jack Henry James. 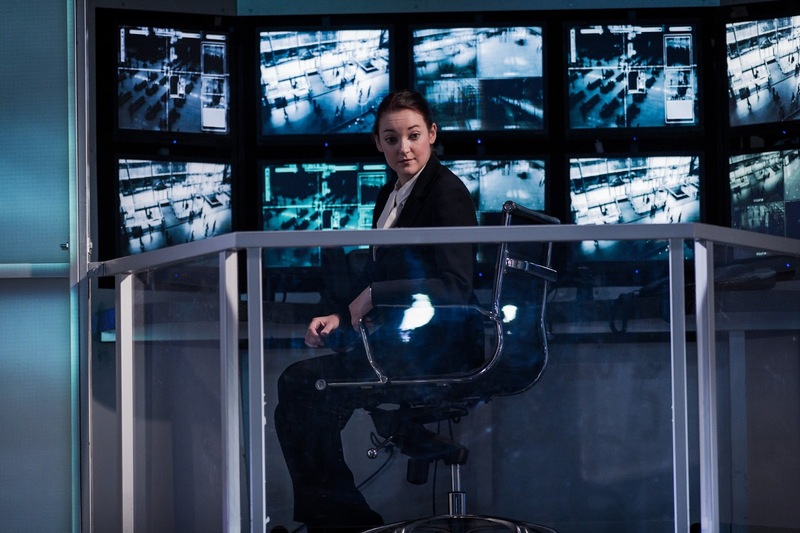 Flight was commissioned by Glyndebourne, and premiered by Glyndebourne on Tour in 1998 with it going on to receive a main stage production in 1999. 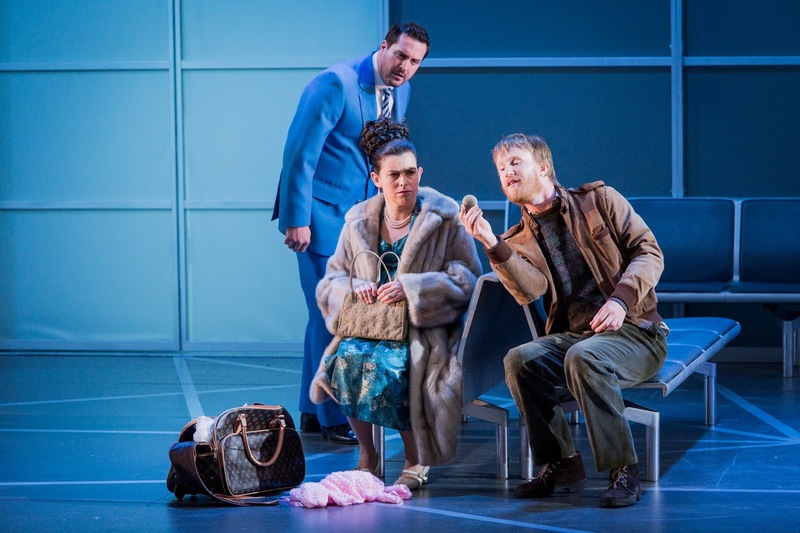 Glyndebourne revived the work in 2005 and British Youth Opera performed it in 2008 (in a production by Martin Lloyd Evans with Andrew Radley as the Refugee, Nicky Spence as Bill and Duncan Rock as the Steward). But rather amazingly this was the first time that a professional company had staged the work in London; a long overdue debut. 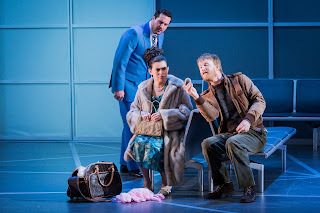 One of the beauties of Flight is that April de Angelis's witty libretto is quite traditionally structured and is unashamedly an opera (rather than trying to pretend it is play where the characters happen to sing). So it is in three acts, with entrance arias for each of the characters, and a great use of ensemble. Reading a summary the piece could almost be a libretto for one of Rossini's comedies. But within this Jonathan Dove's music brings an accessible, yet contemporary resonance to everything. And though April de Angelis's characters are simply archetypes, Jonathan Dove's music fleshes them out and gives them humanity. One of the strengths of Stephen Barlow's production was that it took the whole piece seriously, so that each member of the cast created a naturally believable and real person. Yes, some parts were funny. Achingly so in the case of Kitty Whately and George von Bergen (Stewardess and Steward) with their tryst in the lift, with the lift doors repeatedly flashing open to reveal yet more flesh (this was definitely NSFW) and a more exotic pose; poignantly so in the case of the bickering of Jeffrey Lloyd-Roberts and Ellie Laugharne (Bill and Tina), a couple whose marriage is going on the rocks. But clearly the whole cast had great fun and the other strength of the production was that this was a real strong and balanced ensemble. The plot is quite simple. Set in an airport terminal overseen by the Controller (Jennifer France) in her eerie high above the concourse, the Refugee (James Laing) is marooned there unable to enter or leave because of lack of papers (the plot was based on a real life case), constantly waiting for his brother who has his papers. Around him people come and go, and he scrounges bits and pieces to eat. We meet Bill and Tina (Jeffrey Lloyd-Roberts and Ellie Laugharne), hoping a holiday will bring back the sparkle in their relationship, and very dependent on a self-help book for relationship advice. The Older Woman (Lucy Schaufer) has come to meet her younger lover from Spain where she met him in holiday, he is 30 years younger than her and all she has is a postcard from him. Minksman and Minkswoman (Nicholas Garrett and Victoria Simmonds) are travelling to Minsk as he is a diplomat. She is heavily pregnant and at the last minute refuses to go, he goes alone. 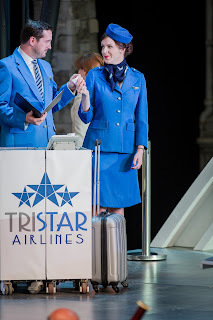 The Steward and Stewardess (Kitty Whately and George von Bergen) are both travelling to different destinations and grab their 17 minutes together for that quick tryst. The final piece in this jigsaw is the Immigration Officer (John Savournin) who appears periodically and forces the Refugee to hide. out that the Refugee has given each of them a stone, they attack him and bundle him into the lift. The last act sees flights resumed and relationships settled. Bill is no longer boring, and a bump on the head means he and Tina start their holiday with clean slate. The Older Woman decides she is going to go on another holiday. The Steward and Stewardess return to their status quo of quick trysts. Minskman returns and Minskwoman is delivered of her baby. 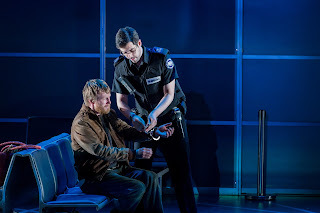 The Immigration Officer returns and finally we hear the Refugee's poignant story. Andrew Riley's set was simple yet elegant in shades of grey, Stephen Barlow made wonderful use of the three lifts which punctuated the stage. Onto the grey back-drop were projected Jack Henry James video designs to evoke the storm and other moments. Though the Refugee is at the heart of the story, he is absent for much of Act 2 but in Act 3 with his recounting his tale the character is placed at the heart of the opera, turning it from an amiable comedy into something far deeper. James Laing sang with a gorgeously even and creamy tone throughout, and in the opening acts brought a lovely seedy, melancholy down at heel feel to the character. Then in his final recitation he was spellbinding in the way he wove story, text and music into a compelling tragic whole. This was singing of great poise and of real heart, and made a lovely change from seeing counter-tenors as eerie non-human beings or swaggering baroque heroes. Jennifer France's Controller was not only physically above everyone else, her vocal line was similarly stratospheric. There were times when the steely control and beauty if Jennifer France's line threatened to veer into harshness, but she brought a wonderful glitter and a superb evenness of tone to all the higher register in a role which has lots of long high lying lyrical phrases. But she also brought real sense of character too, especially in the Controller's Act 2 breakdown, and we left the opera at the end with a real sense of possibility of something between her and the Refugee. Jennifer France graduated from the Royal Academy of Music in 2013 in and is about to become a Scottish Opera Emerging Artist, and this role was a very notable assumption for her. Kitty Whately and George von Bergen were a complete delight as the Steward and Stewardess, clearly having the time of their life and chaneling the TV series The High Life, but there was never a sense of send-up and each singer combined a nice musicality with a feeling of the personality beneath. Ellie Laugharne and Jeffrey Lloyd Roberts were funny in a more Woody Allen-ish way as we laughed to hide our embarrassment at recognising traits in their relationship. Ellie Laugharne brought just the right sense of brittleness to her bright lyric voice, whilst Jeffrey Lloyd Roberts used his dramatic tenor to great comic/tragic effect as well as bravely using his size too. Lucy Schaufer made the Older Woman both funny and touching, obviating the clear danger of finding her funny for the wrong reasons by the sheer poignancy of her performance. Nicholas Garrett's role as Minksman was relatively concise, but he too gave a strongly believable performance. Whilst Victoria Simmonds as his wife was profoundly moving as a woman at the mercy of her body and her hormones, having her own moment of transition at the end with the birth. John Savournin had rather less to do as the Immigration Officer, and as a seasoned performer in G&S with his own Charles Court Opera it must have been tempting to send the role up. Wisely he did not, and it was all the stronger for it. The opera uses quite a large orchestra with significant percussion and Jonathan Dove's John Adams-like repetitive motifs mean that the piece works best if the orchestra is in a pit. Without a piece, Brad Cohen and the City of London Sinfonia gave a superb performance and kept balance problems to a minimum. True, there were often places where diction was occluded but the voices always remained paramount. Yet the orchestral contribution really told, and it makes a strong commentary throughout the action with some dramatic, magical and glittery moments, reflecting the emotional timbre of action. Throughout the City of London Sinfonia gave a beautifully poised and controlled performance and rightly received strong applause at the interval and at the end. 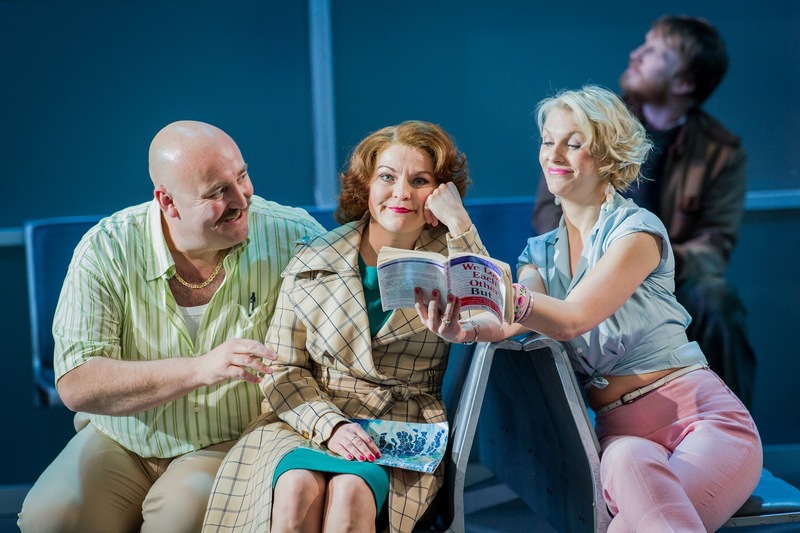 This was a notable achievement for Opera Holland Park, a production in which staging, performance, singing and playing all came together in a satisfyingly balanced whole without a weak link. This is the second opera in a row at Opera Holland Park to which I have given five stars, but frankly I could not think of a reason no to. Performances continue through June, but there are only four more (10, 12, 17 and 19 June), so catch it! But this is one of those productions which certainly deserves continuing life.